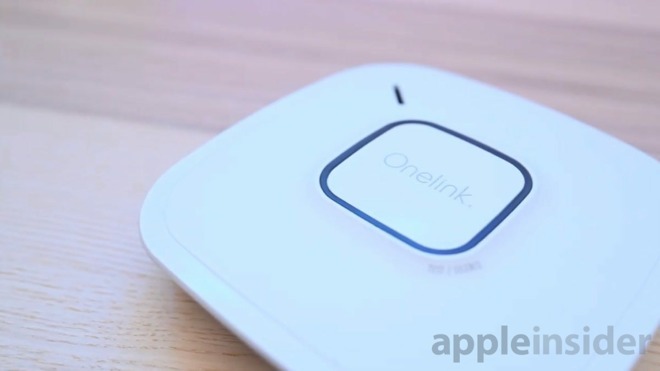 OneLink Smart Smoke and Carbon Monoxide Alarm, a HomeKit-enabled sensing device for the home. The problem with this sort of threat is that it requires some sort of indicator or detection device, with current solutions available including carbon monoxide sensors able to protect the user's home. In a patent application published by the U.S. Patent and Trademark Office on Tuesday, Apple suggests adding such a sensor to devices, including those in smart home and Internet of Things product categories, as well as those under "health monitoring," which could feasibly include iPhones or the Apple Watch. While adding a gas detector to a device isn't entirely novel, the patent application "chemically robust miniature gas sensors" goes further, in suggesting the creation of sensors that maintain their accuracy. Metal oxide gas sensors are said by Apple to be "among the most promising technologies" to be added to consumer devices, due to their small size, low power consumption, compatibility with semiconductor fabrication processes, and a simple architecture. However, Apple warns humidity, the chemical poisoning and deactivation of sensor materials can cause drift in both baseline resistance and sensitivity, affecting its performance and potentially failing the hardware, making it useless. 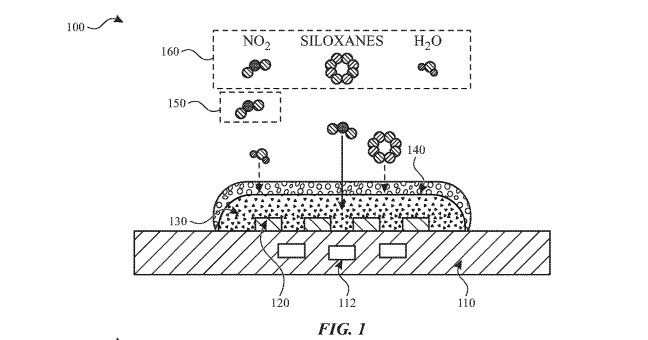 An illustration of Apple's proposed gas sensor protected by an adsorbent layer. 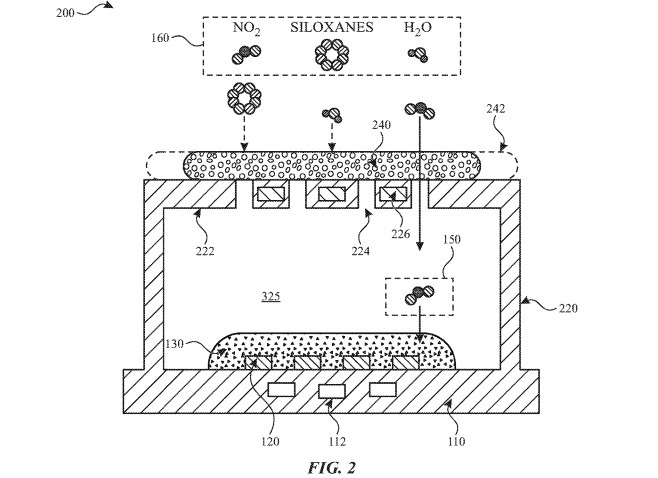 Apple's solution is the creation of a silicon-based substrate with electrodes deposited on the substrate, a gas-sensing layer covering the electrodes, and an adsorbent layer that can selectively filter components of a gas mixture. The adsorbent layer is able to selectively filter the gas mixture to only allow target gases through, such as carbon monoxide or methane, to the gas-sensing layer. A second illustration, showing the enclosure-based design that separates the adsorbent layer from the rest of the sensor. Apple adds that a second set of heating elements could be added to the enclosure, allowing for control of gas flow. With the first elements on and the second enclosure elements off, the system is in a position that allows for "poison removal," namely encouraging it to dissipate around the sensor. Reversing the heating element states are said to help a "regeneration operation" take place. If Apple went down the route of adding them to "health monitoring" devices, this could in effect allow iPhones and the Apple Watch to become a personal gas detector that travels around with its user at almost all times. This portability would allow for added safety when users are out and about in their daily lives, a scenario that typically does not offer much in the way of poisonous gas protection. This is not the first time Apple has considered warning users of environmental dangers. In a December 2016 patent application called "Electronic device with speaker enclosure sensor," Apple suggested adding an environmental sensor within a speaker cavity, giving it some protection from the elements while allowing the natural air movement of the speaker diaphragm to help it collect samples.